Russian author; born at Tiktin 1812; died at Suwalki Dec., 10, 1870. Schönhak led a retired life, devoting his time to writing and study. He was the author of "Toledot ha-Areẓ" (Warsaw, 1841) and "Ha-Mashbir," or "'Aruk he-Ḥadash" (ib. 1858). The "Toledot ha-Areẓ" is a natural history in three parts. The subjects are arranged and classified, and a full description of each is given as to color, form, and habitat. Those that are mentioned in the Bible are given book, chapter, and verse; and so with those mentioned in the Talmud. The "Ha-Mashbir" is an Aramaic-German rabbinical dictionary, based on Nathan ben Jehiel's "'Aruk." 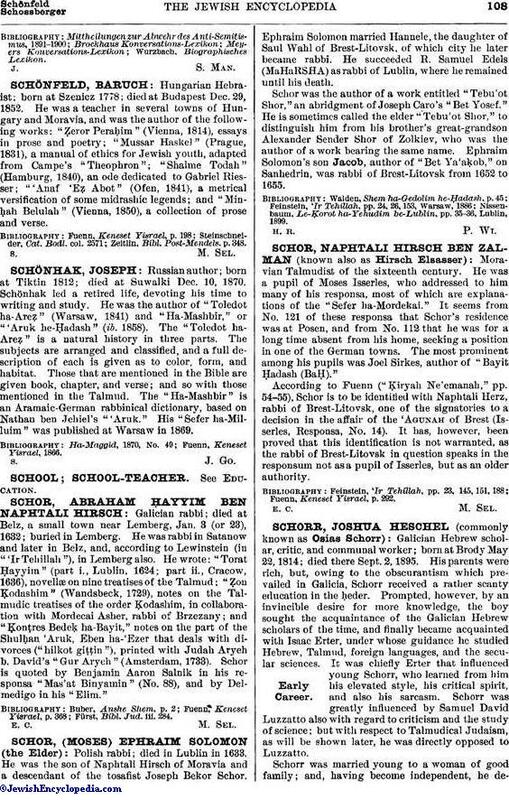 His "Sefer ha-Milluim" was published at Warsaw in 1869.